The Women of Grace Missions Fellowship at the Grace Brethren Church sew for the girls of Project Hope and Charity. 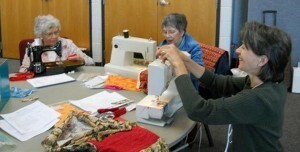 In November, the Women of Grace Missions Fellowship of the Grace Brethren Church in Columbus, Ohio, gathered to make “pillowcase dresses” to be sent to Project Hope and Charity in the Central African Republic. 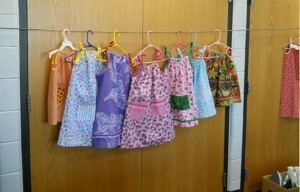 The simple dresses follow a pattern found at Nancy’s Notion’s using a pillow case or cotton fabric. The Columbus women hope to make 200 of these “pillowcase dresses” for the girls of Project Hope and Charity. Their goal is to make 200 dresses to be given to the girls of the orphan care ministry.